Started NOW! 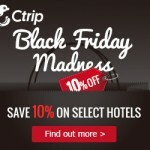 Enjoy your best holiday with Ctrip on Black Friday! Terms & Conditions: 1.Promotion period: From 23 Nov 2016, midnight – 25 Nov 2016, 11:59 p.m. (Beijing Time) 2.Eligible users: All registered Ctrip members. Only one promo code per Ctrip account can be used during the promotion period. 3.Promo code is only valid for select hotel room bookings displayed on campaign landing page. 4.Promo code is valid until 25 Nov 2016, midnight. Promo codes are limited to 3,000, and will be given on a first come, first served basis. 5.Eligible hotels: Promo codes can be used for prepaid rooms with a promotion code icon for a discount of 10%. Promo codes are only valid when paying in CNY.